How much do local colleges and universities spend on Men’s basketball? What is the difference between “big-time” programs and mid-majors? Utilizing the chart and table listed above one can compare the financial commitments of PA, NJ and DE colleges to their respective Men’s Basketball programs. There are a few surprises. 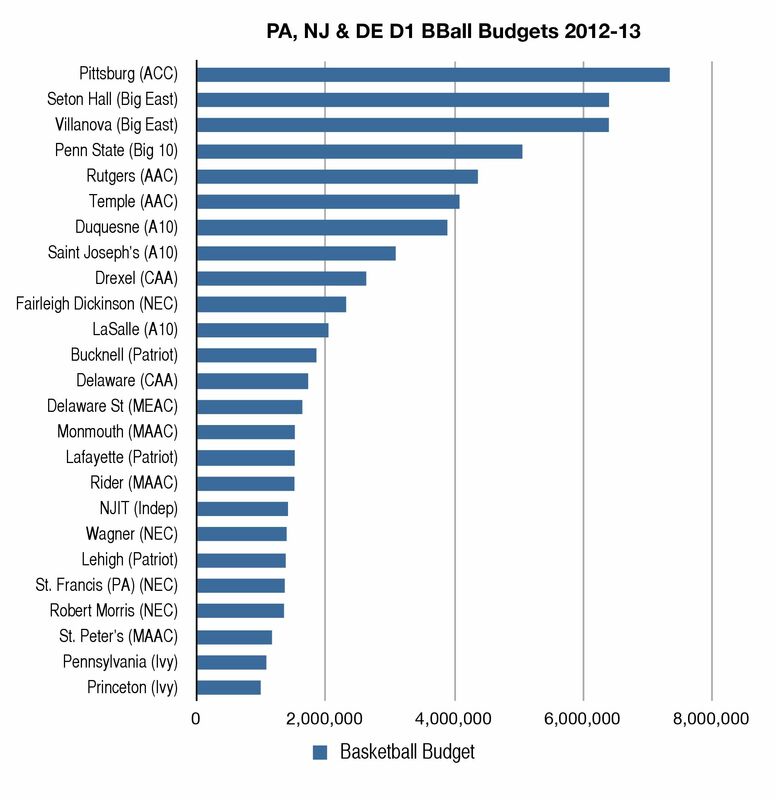 A few things immediately jump out when comparing the basketball budgets of PA, NJ and DE Division 1 programs. Seton Hall has not been getting an adequate bang for their buck. But perhaps most surprisingly, Lehigh with one of the smallest budgets has the highest academic record, the 5th highest number of average wins and a lottery pick in last years draft. Drexel’s basketball budget is larger than two of the Big 5 programs (LaSalle and Penn). Fairleigh Dickinson’s budget is very high given their very low average wins and poor academic performance. Delaware State, a historically Black (MEAC) school is in the middle of the pack budget wise.